When the Foot Meets the Pedal + BikeFit: The Foot/Pedal Interface online. Priced to save you money. When the Foot Meets the Pedal + BikeFit: The Foot/Pedal Interface online are combined to save you money! Over 30 years ago during my Sports Medicine Fellowship, I was told that you cannot assess a cyclist’s performance or injury without looking at the bike fit. Since then, I have rarely evaluated a cyclist in clinic without checking her/his position on the bike. With practice, I also learned that the foot-pedal interface is a key factor for a successful bike fit. With their new book “When the Foot Meets the Pedal,” established bike fit experts Paul Swift and Dr. Katrina Vogel have completed another step in their effort to educate on the applied science of bike fitting. This easy-to-read, well-illustrated book condenses a lot of information about the proper assessment of the cleat’s positioning and alignment. The readers, from bike fit professionals to the more serious cyclists, will find a lot of valuable and practical information, supported by great illustrations that take them step-by-step from the basics to the advanced understanding of the topic. I strongly recommend the reading of this book. It will be a fun and productive experience. 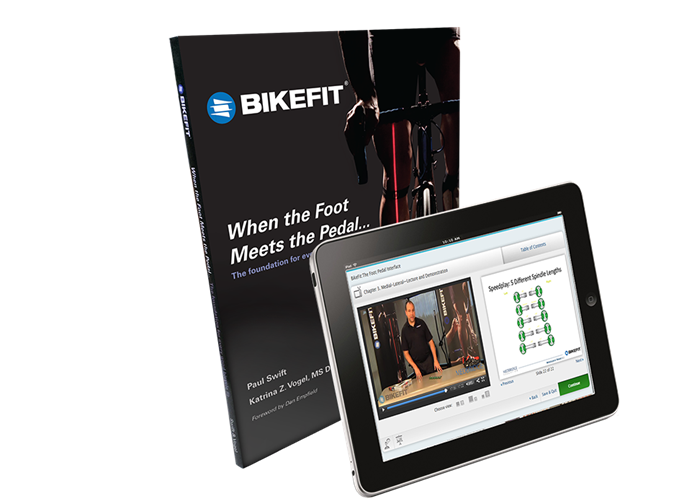 BikeFit: The Foot/Pedal Interface online is a complete, easy to understand, step-by-step process. Become a professional bike fitter with our online course. Self-paced training will guide you through the foundation of bike fitting: the foot/pedal interface. While designed to provide clinicians and healthcare professionals the opportunity to increase their knowledge and skills regarding bike-fitting with specific emphasis on the importance of the Foot-Pedal Interface, it provides valuable information no matter your fitting service career path. This is your chance to grasp the assessment of normal and pathological cycling mechanics, including functional differential diagnosis in an easy to learn format. With your purchase of the EDU combo, you will receive the manual and a coupon code to register your use of the online course for 1 year with our partner, MedBridge Education (a small processing fee of $5 will be assessed upon registering).